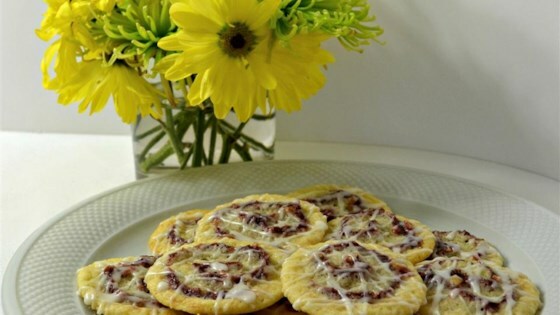 "Sugar cookies are swirled with raspberry jam, coconut, and walnuts and topped with almond glaze. They start from refrigerator dough. I make these for Christmas and Valentine's Day and I always get asked for the recipe." Preheat oven to 350 degrees F (175 degrees C). Spread coconut and walnuts onto a baking sheet. Bake in the preheated oven until coconut and walnuts are toasted, 5 to 7 minutes. Remove from oven and finely chop walnuts. Combine raspberry jam, coconut, and walnuts together in a bowl. Divide cookie dough in half. Roll 1/2 the dough into a 12x7-inch rectangle on a lightly floured surface. Spread half the jam mixture over rolled dough to within 1/2 inch of the edges. Carefully roll dough, jelly roll-style, around filling; pinch side seam to seal roll, keeping ends open. Repeat with remaining dough and jam mixture. Wrap each dough roll in plastic wrap and refrigerate until firm, about 1 hour. Preheat oven to 350 degrees F (175 degrees C). Remove plastic wrap from rolls. Cut dough into 1/4-inch thick slices and arrange on a baking sheet. Bake in the preheated oven until edges just begin to brown, 7 to 9 minutes. Cool cookies for 1 minute on the baking sheet and transfer to wire racks. Whisk confectioners' sugar, water, and almond extract together in a bowl until smooth; drizzle over warm cookies. I had my doubts about this one, but they ended up being a pretty and decadent cookie.I bet these would be great with homemade sugar cookie dough!